4' Inflatable LED Color Changing Christmas Tree! There is a light in every ornament that changes colors! 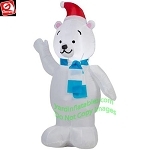 This Inflatable Christmas Decoration comes with a low voltage fan, internal L.E.D lights to create a glowing night-time display. Includes Fan, yard stakes, and tether ropes.